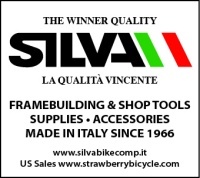 Silva was founded in 1966 by Mr. D'Andrea Silvano whose work in both ferrous and special alloys for high-end bicycle accessories early on caught the attention of the great masters of framebuilding such as Colnago, De Rosa, Olmo, Bianchi, etc. In the 1980's SILVA acquired a small company which produced handlebar tape and with the creativity and innovation in Mr. Silvano's soul developed the famous cork handlebar tape of worldwide renown. In addition to handlebar tape, SILVA developed a line of production quality tools for both bicycle framebuilding and bicycle shop mechanics. In 1999 SILVA obtained the UNI EN ISO 9002/9190SILS guarantying the highest quality of materials, design and production of SILVA products. Today SILVA continues to manufacture its products from raw materials to packaging, all "Made in Italy". Strawberry seeks to import and distribute as much as possible of the SILVA line of products throughout USA. Silva art. 030 spiral flute seat tube reamer in 27.25mm. diameter with 20Mx2.0 threaded top end. Price $196.00. To order, please contact Andy. PayPal and good check accepted. Silva art. 407 Interchangeable seat tube reamer in 27.2mm. diameter. 60mm. length x 14mm. bore with cross slot 4.6mm. width. Price $145.60. To order, please contact Andy. PayPal and good check accepted. Holder for Silva spiral flute seat tube reamer no. 407. The handle is the LAN71 head tube mill handle only (so, if you already own the LAN71 head tube mill you need only purchase the arbor and reamer). The arbor is machined to mate to the handle securely with an 8mm. socket head cap screw and the Silva no. 407 spiral flute seat tube reamer is also secured to the opposite end with an 8mm. socket head cap screw. Holder complete with handle and arbor but without the reamer is $65.00 Arbor only is $25.00. Holder complete with handle, arbor and reamer is $210.60. To order, please contact Andy. PayPal and good check accepted. STM004 SILVA no. 398-31.6 spiral seat tube reamer 31.6mm. diameter.